Wonderful image. I am really jealous. How do you take these images ? I NEED to make it out there to take some pictures! Stunning!!! Congrats on your blue, excellent shot! Simply magnificent. Congrats on the blue! I am in total awe of this set you've done. Just stunning and the colors are breathtaking! Well deserving of the Blue. An image with lovely line flow and enchanting colors. Congratulations! Congratulations Arpita! This had blue ribbon written all over it. Simply beautiful. Congrats on your ribbon! Another ribbon for the fantastic Panasonic FZ20....nice work. Crazy, and definatly well deserved!!! Nice Job! Love it! Out of this world! Congratulations on another fine shot. Congratulations Arpita. Not only the winning shot,but the other pictures are also very wonderful. This place seems to be to beautiful and colourful to die for. As many times as I see these canyon shots, I'm left in awe. Congrats on your ribbon Arpita - it's a beauty! This is stunning! Congrats on your Blue! Arpita, you shoot a mean image no matter what camera you use! Many congrats on another blue! congratulations on your Blue with this stunning image, so beautifully captured and composed! A stunning place, I always love looking at photos of it. You did a wonderful job on all of them, but I particularly appreciate having ONE in that series (your ribbon shot) that includes a person. Without that, it would have been impossible to judge the scale. Just knew this would be a winner!!! Outstanding and you certainly didn't need to wrestle the 10 out from me (which I don't usually give easily). Most deserving :). Just a beautiful capture! Congrats. Congratulations on your ribbon! Awesome shot! Hehe, this place seems to be to you americans what northern lights are to us Icelanders, almost a guaranteed ribbon or top 10 shot! Love that location so I am not at all surprised, I definately want to go there someday, for now I am just glad people like you are able to capture the beauty there for those of us that aren´t able to go there ourselves. Nice work! Congratulations, this is lovley image, so soft and colorful. Now this is a place I would like to visit. Beautiful framing.. congrats on ur win!!!! My country is flat as a cookie on a tray, lucky for you you made that trip. Wonderful nature. Congrats on blue. Message edited by author 2006-06-21 02:08:08. OMG! Haven't seen many challenge entries from you, Arpita - obviously you choose just the right image for just the right challenge and then POW! ;-) Congratulations! This is incredibly other-worldly! Outstanding in every way possible. Congratulations on your well deserved blue! I thought as much. ;-) Congratulations on the Blue Ribbon. Absolutely wonderful. Love the red tones in this, as one usually sees the warm earth tones. Congratulations on a well deserved ribbon! Congrats on a well deserved blue. Congrats on your Blue. This is an awesome shot. I can't believe a place like this exists. I HAVE to go there. Thanks for sharing this wonderful shot, and congrats!!!! I love these sandstone canyons!! Great Shot! Congratulations! Love the colors, shapes and texture! Beautiful textures. Is she red from color tweaking, or from the red stones surrounding her? I know you tried to convey the person was framed, but I think this shot would look so much better without her. It's gorgeous, anyway. Beautiful place! Where is it? I have found 4 outstanding images in this challenge, and this is one of them. Returning just for another look as i love it. Decided that this should win. So there that's decided, pick up your blue ribbon. wow, where does this colour come from. Is it natural red? WOW! Look at those amazing colors! Strong lines working this photo! 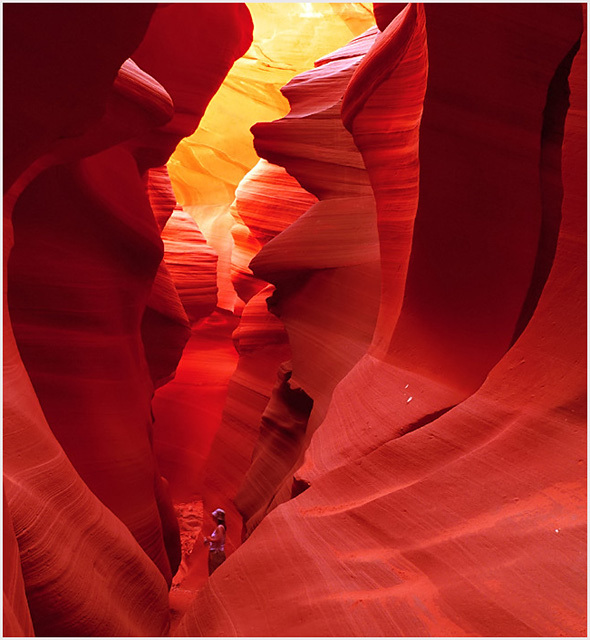 This slot canyon really minimalizes your subject. Nice work! Good frame but subject is a little small in relation to the frame. Magnificent place, a photographer's dream. You should do well in the rankings with this one. Nice composition and impresionantes colors. From my point of view, the framed model is too small. Details: Capture an image where the foreground subject frames the rest of the image. But it is some kind of framing in the foreground, enough for a nine from here. Wow - incredible colours and dimensions! Where is this? Wow, I can see this winning, it is amazing. WOW, excellent photo... I love the colors. Great job! Awesome. Was This is in Utah? Oh...My...GOD...I can't believe these colors!!!!!!!! !This one wins, I bet! Lovely take on an oft-photographed location. I really like the way you've created the framing. Her purple clothing works well - although she's tiny within the frame the colour subtly pulls the eye towards her after it's initially wowed by the reds of the sandstone. wow1 Love this one. The colors- holy cow. Incredible. The colours are absolutely breathtaking. And the lines and curves are so well defined. A winner. beautiful image which would have benefitted from her not being in the shot as it looks like she just happened to be there. wow. those are some rich colours. nice shot. Wonderful color, good exposure and capture of detail, and very nicely composed! Proudly hosted by Sargasso Networks. Current Server Time: 04/20/2019 04:12:17 PM EDT.